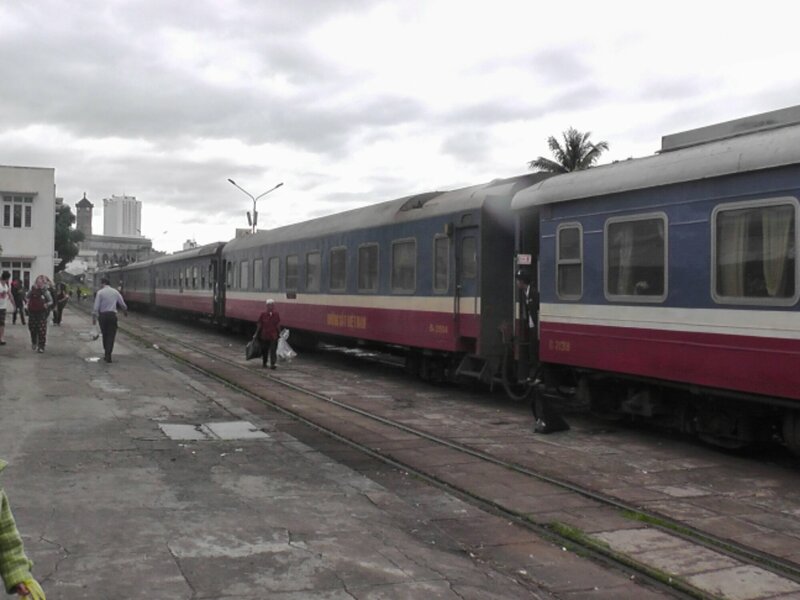 Train rolls into Nha Trang about an hour late, but considering we’d been hearing 9:30 that was a bonus. There was 8 of us all heading to Mojzo Inn, so we headed for the taxi line and bartered 2 taxis to take us there. The girls working at Mojzo Inn are so friendly! Even though we still had a good 5 hours before we could check in, they had our luggage in storage and urging us upstairs to have breakfast while shaking our hands and memorising all our names. Sadly we weren’t anywhere near as good as them at remembering. While waiting for our rooms to become ready, some head out to explore the city, while the rest of us hang around the lounge to socialise and catch up online (and in my case, grab a shower). As it happens, sticking around is the smart choice, because within an hour we were allowed to check in. Room is nice, though could really benefit from a window. 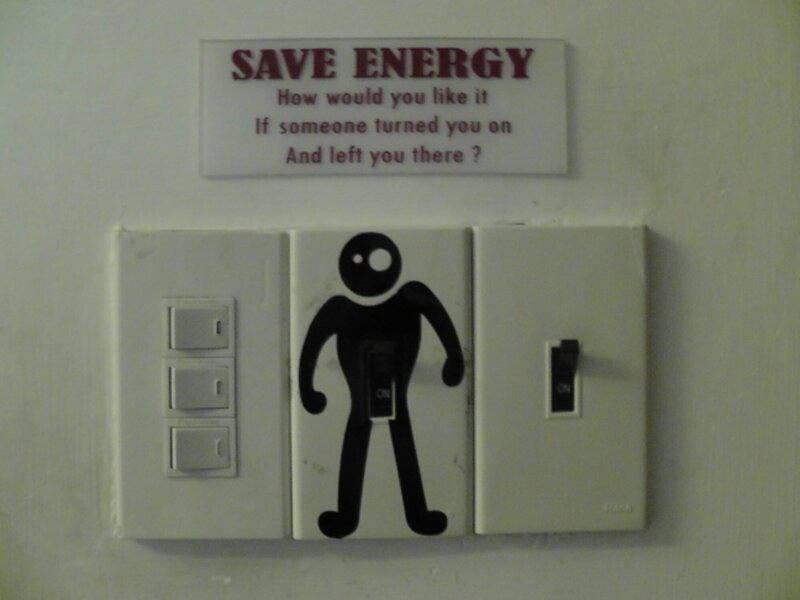 Also has the best light switch and energy saving warning ever. Nobody really had a plan for today, so everyone decided to grab a towel and head for the beach. The weather is (finally) warm, although not hot, and perfect for lying on the beach. As we do, we are joined by 2 more backpackers, also from the Sunflower Hotel though I hadn’t met them. One of them however had a very telling souviner of Vietnam. He’d been riding a motorbike and been in an accident, so his legs, knees, arms, chest and ear were covered in scabs, and his shoulder was just a giant mass of pink skin and healing gouges. Vietnam roads can be dangerous, and not sure his insurance will cover that considering how many hoops you have to jump through to drive legally in the country that people don’t always know about. He invested in a beach chair (35,000 dong) while the rest of us just lay towels down on the ground beside him and dug out our reading material. Those that hadn’t brought any headed straight into the water to have fun in the relatively calm waves, and when they returned a gentleman carrying a pile of books was waiting. Vietnam know their tourists. As well as hawkers selling water and fancy bracelets, there’s also several people going round with boxes of used books for you to read, Have to haggle them down to a reasonable price, and he went running back to his shop when one of the guys in the group requested a specific book, but if you need something new to read, the beach is a great spot (plenty of shops offering ‘book exchange’ too). There were also food vendors walking around. Women walking around with baskets filled with fruits, corn on the cob, and even crab and lobster – plus the cooking utensils required to actually cook them once they were bought! Was tempted by the seafood, but decided to hold back since I wasn’t actually hungry, but some of the girls in the group did buy some pineapple from a fruit woman. Who then cut and sliced the thing in front of them creating a pretty awesome edible treat. Sadly, the wind picked up and the sun vanished behind some clouds, and we all decided to head back to the hostel after a few hours. Most of the group wanted to do a mud bath, so booked that through the hostel, while I went exploring. 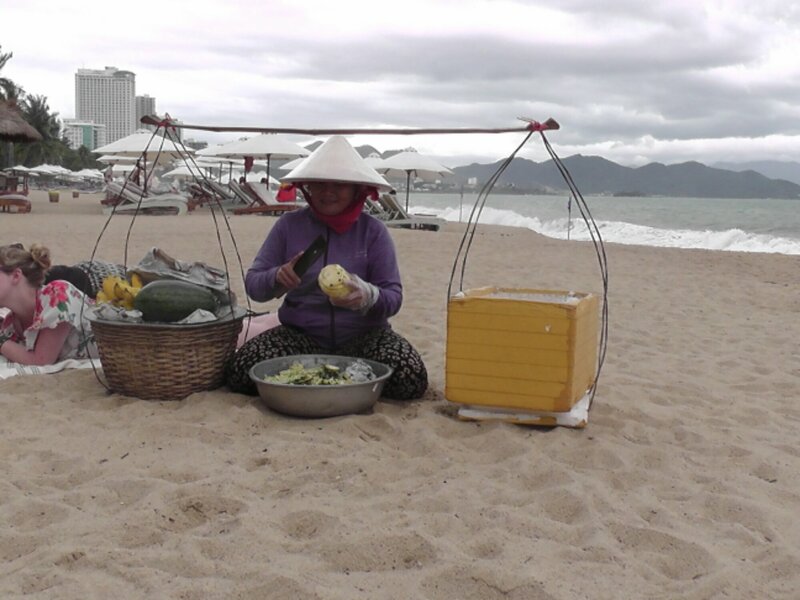 Nha Trang is very much a seaside town, but also manages to hold onto a piece of Vietnamese charm. While wandering I managed to hunt down the local food market, which was fantastic (if slightly nerve wracking thanks to the constant bike traffic) to see. Also gave me a chance to practice my Vietnamese, which had been improving, but now had to deal with an accent change (the South pronounce a lot of things differently from the North). Had some success, and ended up buying a baguette (adore Vietnamese bread) and a whole pineapple of my own. Which was so unbelievably acidic I had to toss the last quarter away or risk losing every taste bud I still had to its acidity. Considering I eat whole pineapples back home all the time, it just goes to show the difference in taste. When I headed back to the hostel, it was a case of talking to those who hadn’t gone mud-bathing and enjoying the social room (one of the few hostels that actually had a lounge area!) before the others came back, and began the long, arduous process of getting ready to go out (genuinely hard when you have 12 people and 2 showers). We decided to go to a local Greek restaurant, as someone at the hostel had just been and highly recommended it. She also said the food was pretty cheap, so everyone was up for it. Then I opened the menu, and realised everyone else’s definition of cheap was not the same as mine. Almost nothing on the menu was for less than 100,000 – and not including my first meal in Hanoi, I’d been eating meals on a 40-60,000 budget. My suspicions are confirmed when it hits my tongue and I taste chicken. Thankfully, my aversion to chicken seems to have finally abated because I didn’t immediately rush for the toilet. I brought the waitress over to check the order, and looked liked she’d written down the wrong thing. That said, she then set the plate back down and walked off. Clearly, even though it wasn’t what I’d ordered I was expected to take it anyway. Thankfully it was still very good, and very filling so it wasn’t a complete disaster. 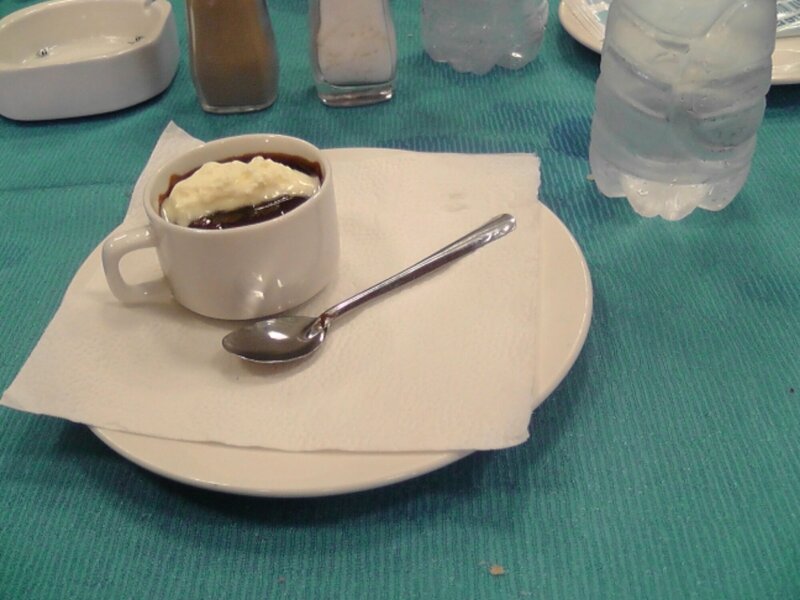 Some people ended up ordering multiple meals Vietnam style, and the restaurant surprised us at the end when they gave us complimentary desserts (tiny little expresso cups filled with a hot chocolate sponge, icing and a tiny dollop of ice cream. It was unbelievably good (decent bakery chocolate!) and I scraped my little cup clean much to the amusement of the others. Once we were filled, it was off to do something I don’t normally do when I’m backpacking. The Pub Crawl/Clubbing directive. We all headed to the first point of call, a pub currently still in the throes of a shot glass happy hour called ‘The Red Apple’ where nearly the entire hostel were drinking. Now I’m not a big fan of pubs in general, but this was definitely not my kind of place – the music was so loud you couldn’t really talk to anyone, but it was so small you couldn’t dance to the music either. So when a few girls started migrating to the next point of call I joined the flock. The ‘Why Not Bar’ was much more like it. It’s a large bar in the opposite direction of The Red Apple, and part restaurant so the music is quiet enough in places to talk to people, but also has a dance floor. I ended up there for some time (attempting) to dance with randoms and darting over to talk to the ever growing table. Around 11:30 though I hit my peak. I’m not a partier, and people were getting decidedly drunk. Plus a night train does not necessarily give a good nights sleep so I was running on fumes. Headed back for the hostel and called it a night…really hoping my roommates don’t make too much noise when they crawl back. 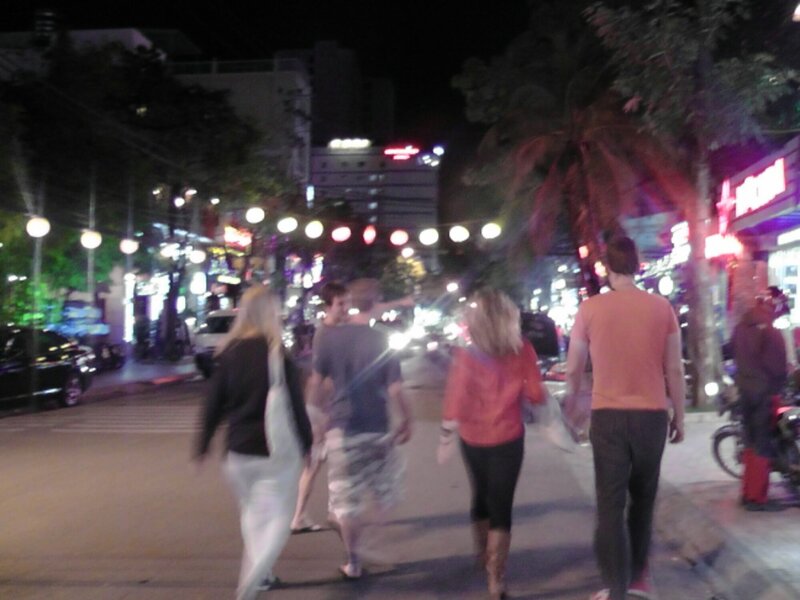 This entry was posted in Diary, Vietnam and tagged Mojzo Inn, Nha Trang, The Red Apple, Vietnam, Why Not Bar. Bookmark the permalink.